A professional football player who is under contract at a club is restricted in their movement between clubs due to a ‘transfer window’, the media’s term for FIFA’s ‘registration period’. According to FIFA Regulations on the Status and Transfer of Player, national football associations must decide on the dates for the first registration period (which can not exceed 12 weeks) and the second registration period that takes place during the season (which can not exceed 4 weeks). In mainland Europe, the transfer window is predominantly open from the beginning of June until the end of August (off-season period) and then again for 1 month in January (mid-season). Contracted players can not seek permanent employment at another club outside of these dates, they can however secure loan moves (league rules permitting), unemployed players (free agents) can however join a club at any point throughout the season and secure registration for their respective leagues. The idea behind introducing the ‘transfer window’ was to bring stability to clubs and to prevent player agents from searching all year round for a transfer. My view on the transfer window is that from a supporters view it has added to the spectacle off the field with the commonly known ‘Transfer Deadline Day’. From a football manager’s point of view it adds security for a period of approximately 6 months as they know a player can not leave until the next ‘window’ opens. However, it is not only the players that are regularly changing clubs, in the recent years, we have seen the common trend of football managers changing clubs throughout the season. When a manager moves directly from one club to another, its no different from a player transferring to another club. The new club will pay compensation (a transfer fee) to the old club for their manager, exactly what happens in a player transfer, except, a player may only move within the ‘transfer periods’. Statistics so far this season (28 August 2012 – 28 March 2013) show there has been 44 management changes from the Premier League to League Two, 10 of these 44 changes, has seen a manager move directly from one club to another, in some cases, Michael Appleton, moved twice (November: Portsmouth – Blackpool, January: Blackpool – Blackburn). In accordance Article 5.2 of FIFA Regulations on the Status and Transfer of Player, during one season, a player can only registered for three different clubs but are only eligible to play for two of them, therefore, if a player did what Appleton has, they would be restricted from being able to play for the third club, why should it be different for a manager? 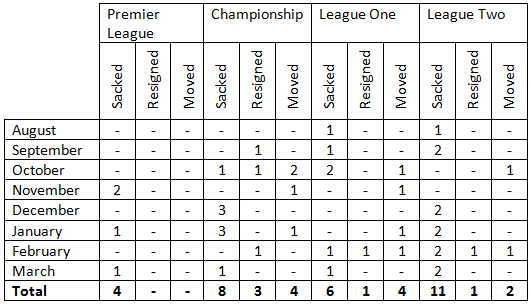 See the table below for full statistics of league by league manager sackings, resignations and moves. Reason for changes in management from; Premier League, Championship, League One & League Two. When comparing the number of managers that have progressed directly on to another club from 1993-2009 and then 2013 its evident that this is a growing trend, See graph below for full statistics of management progressions from the; Premier League, Championship, League One and League Two. Year by year of management progressions from one club to another. Clubs will inevitably sack managers, they may reach an agreement of mutual consent to leave or they may resign, just like players sometimes agree to cancel their contracts early, however, I think it would benefit the stability of the professional game if clubs were restricted to who they could then bring in. Clubs may decide against sacking a manager early, in the knowledge that their number one candidate is currently employed by another club and therefore restricted to move outside the ‘transfer window’. It may also provide an opportunity for those managers who are unemployed, that are seeking re-employment in management, a chance back in, as an astounding 49% of first time managers never manage again after their first managerial exit (Bridgewater, 2010). Therefore, I believe that just like players, managers should not be allow to switch clubs outside of the ‘transfer window’, although a manager who is a ‘free agent’, should be allowed to move to a club seeking a manager at any time. Following all the principles of the player’s ‘transfer market’. However, on the other hand, this may increase the number of managerial resignations in order to become unemployed and then gain employment within another club when the ‘transfer window’ is closed. Therefore there is still room for further developments in this area. Bridgewater, S, (2010). Football Management. FIFA, (2003). Regulations on the Status and Transfer of Players.